I had some dill leftover from a disastrous dish I made a couple days ago (which I won't even consider making any of you suffer by posting it), and what goes best with dill? Salmon of course!! And what am I an addict for? Pasta! Of course! I had a can of salmon in the cupboard and I always have pasta available. This will be my entry for the weeks Presto Pasta Nights which is hosted by Noob Cook this week. It's just too delicious not to share on a larger scale! My recipe guinea pig loved this dish. It was one of those meals that cause allot of "mmmmmm" noises while eating. A sound I think any cook loves to hear! I love the idea of salmon with pasta. Thanks for sharing with PPN this week. I saw this on presto pasta and it looks great! I love salmon and am a spice lover too...some red pepper flakes would be a great touch. 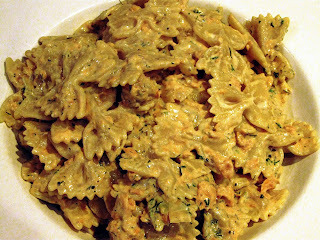 No question - salmon plus dill plus pasta equals a perfect meal. Thanks for sharing with Presto Pasta Nights. Come back often!